The Park’s three-strut design and Swept Compact C outline results in a very stable and responsive kite. The powerful profile and leading edge give the rider good low-end power and consistent pull over a wide range of wind speeds. The Park uses just enough sweep to maximize depower and allow for easy relaunch. The Swept Compact C platform remains very close to a real C-shape in order to provide the crispness and feel in the bar that you really need. Every kite should be seen as an assortment of characteristics. By combining them this will give you its 'face' (kite feeling). 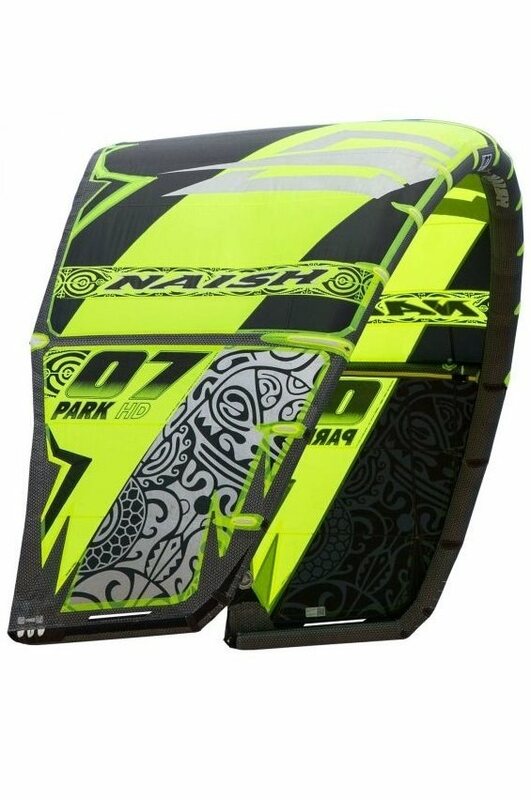 In some kites, a certain characteristic is pretty dominant and this is the case for the Naish Park. For the Park, the dominance lies in that it's continually trying to find the edge of its wind window, making it pretty unwieldy at first glance. This is pretty challenging for beginners and in gusty conditions, but offers an opportunity for freestylers in its pop. The Park is therefore an advanced performance kite for freestylers and wave riders (who will value its playful character). Its turning circle, reaction speed, short depower and great feedback do suffer a little from its intention to find the edges of the wind window, but keep it up to speed and what you'll get is a fast kite with constant pressure. It doesn't have a lot of boost when you turn a kite loop, which should give you confidence while downlooping for waves. All in all, the Park has quite a complex character. You either love it or you hate it. Our advice to you is to test it, play a little with its settings and find out if it's the one for you! Please write your Naish Park 2013 kite experiences, we know different kite sizes gives different feeling so your input is certainly welcome! I think the park is a good allround kite. It gives a direct feeling. Good for an advanced allround kiter. It is good to use in the waves as well. The feedback is very good, which makes it attractive to go for new tricks. It gives a save feeling, the kite feels under control. High quality kites. Safety system is very good. It is easy to handle. The design of the kite is very Nice. If the wind is light, relaunch is harder and the kite is more likely to backstall. The dower cord is on the chickenloop, so when unhooking it van get stuck... But it is easy to reach. Epic kite based on my style of riding. For freestyle, i think this is one of todays best opportunities. Also kitelooping and just playing around is really fun with this kite! !